Maggie Beer and Simon Bryant co-host The Cook and the Chef on ABC television. She is an inspired cook with an international reputation for mouth-watering home-cooked dishes, created without recipes, using only the best seasonal ingredients. He is Executive Chef at the Adelaide Hilton where he co-ordinates 34 chefs, two restaurants and room service and creates five-star masterpieces daily. Barry McCann trained as a commercial chef and loves the program – though he now works as a full-time artist. Given the go-ahead for the portrait, he hopped in his car and headed for South Australia where the show is recorded. Born in Armidale in 1962, McCann was originally a watercolourist but now paints in other mediums including acrylic and oil. He and his wife Lucy run McCann Fine Art. They teach art in their studio and to groups throughout the region. McCann has participated in numerous group exhibitions. He was Highly Commended in the 2007 Gold Edition Equine Prize and in the rural subject/landscape category at the 2007 Sydney Royal Arts Show. 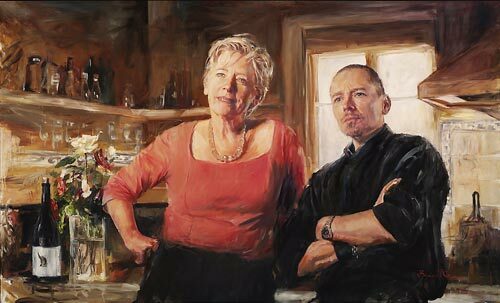 He was also a finalist in the 2005 Hazelhurst Art Award and the 2004 Shirley Hannan Portrait Prize. This is his first time in the Archibald.